(ZIZ)– A technology training course for the visually impaired came to an end on Thursday signalling the beginning of a larger project to empower the visually impaired. About a dozen participants received certificates at a closing ceremony at the McKnight Community Centre for their work with the Job Application With Speech, or JAWS software. 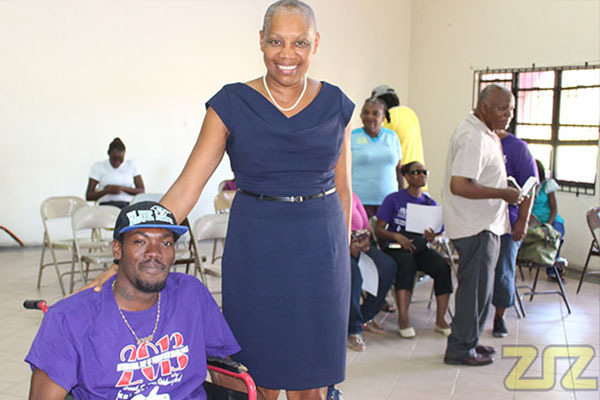 Anthony Mills, president of the St.Kitts Nevis Association of Persons with Disabilities said the idea is to give disabled persons the skills to make them more independent. “Well I hope to see people with disabilities become employed either working for somebody or working for themselves. Because that’s the whole purpose of this training program…to enable them to be able to use the skills they have to earn a living and to be independent,” he said. Minister of Community Development, Hon Marcella Liburd says her ministry’s mandate is to end discrimination. “Invariably, the people who are stigmatized…this is one of the groups – persons living with disabilities. And so we believe that if we really want to ensure that all of our people are educated; especially in this information age that we would have to find a way to ensure that people living with disabilities also have access to the computer,” the minister said. The training course was an introduction to the software. Officials say they plan to hold follow up courses to continue the participants’ training.